Parking in the West Loop is already a painful experience for Chicagoans—right up there with braving a Polar Vortex and pretty much any amount of snow shoveling. So it's no wonder that West Loop residents were peeved when, about a year and a half ago, even more parking restrictions were proposed for the area. The restrictions—which affect a nice chunk of residential streets, including Laflin, Peoria and Morgan—were the brain child of the West Loop Community Organization, a neighborhood chamber of commerce. The whole idea came about as a plan to curb "day trippers," people the WLCO said were driving into the city, parking their cars in restriction-free West Loop spaces, then taking public transit downtown for the day. According to city data through November 2014, at least $150,000 in parking tickets have been issued in those restricted areas since July 2013, when the rules went into place. Enforced from 1:30 to 3:30 PM, Monday through Friday, the parking restrictions prevent anyone—even people who live on the street—from parking during those hours. The penalty? A hefty $100 ticket. The restrictions weren't intended to be permanent—the program was initially only supposed to run through December 2013. But in May, the City Council voted unanimously to extend the restrictions indefinitely. Alderman Walter Burnett Jr. (27th) initially sponsored that ordinance along with aldermen Danny Solis (25th), Bob Fioretti (2nd), and Jason Ervin (28th). But Burnett must have changed his tune at some point. 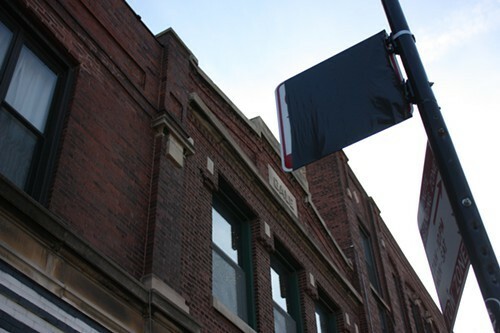 Over the summer, in response to complaints from constituents, the 27th Ward alderman told his staff to put bags over all the signs, despite the City Council's extension of the restrictions. More recently, Burnett said the 27th Ward had an "agreement" with police not to hand out tickets for the bagged signs. Still, from June to November, over 300 tickets were issued to drivers who parked in the restricted areas. The alderman acknowledged several problems with his strategy, one being the insolent Chicago weather which could—and has—blown bags off many of the signs. Another issue is that no deal was made with Chicago Parking Meters' ticket writers. "We were hoping that the ticket agents . . . if they didn’t see the signs they’d know not to give a ticket," Burnett said. "Yeah it's a danger, but we had to do something. Because, you know, we were over that and people in the community were asking for it." Burnett is being challenged in the February election by 31-year-old businessman Gabe Beukinga, who was officially recommended to the ballot by a board of elections hearing officer Wednesday. Now, Burnett says he's going to introduce an ordinance to abolish the signs altogether at the next City Council meeting on January 21. After that, he says he'll consider an alternate proposal for parking restrictions in the area, this one from the West Central Association, another West Loop-oriented chamber of commerce. That plan would call for a 7 AM to 9 AM parking restriction along the same streets as the current West Loop parking restrictions (with an option for residents of those streets to obtain permits). West Central's plan also calls for additional meters along Madison Street, west of Racine, stopping just east of Ashland.